Slide mouse over and Click screen to change slides or use Arrows bottom left corner! Please use Scribd. scroll bar provided on right to view entire document! As we begin a study of the seven churches of Revelation, I think a foreword to the reading is in order. There are differences of opinion, differing views, and differing methods of interpretation concerning this section of Revelation. Admittedly, Revelation does present some difficulty because of the figurative language and symbolic nature. Because of this, many have avoided talking about this book altogether. Some preachers/teachers will never broach the subject because they believe the book to be too controversial or too mysterious to ever bother studying. I believe not only is this a foolish stance to take, but also one that robs people of the blessings of God. The very first chapter of Revelation promises a blessing for those who will read, heed, and obey the message of the Holy Spirit. (Rev 1:3). We are also warned at the end of the book not to "take away from the words of the book of this prophecy" because if found guilty of doing so "God will take away his part out of the book of life, and out of the holy city, and from the things written in this book" (Rev 22:19). We read in II Timothy that "all scripture is given by inspiration of God, and is profitable for doctrine, for reproof, for correction, for instruction in righteousness:" (3:16). This includes other biblical apocalyptic (not apocryphal-there is a difference) writing, as well as the psalms, the proverbs, and other wisdom literature of the bible. The book of Revelation is often seen as the new testament companion to the book of Daniel. If you will read the book of Daniel in parallel with the book of Revelation, you will immediately begin to see some similarities. That's the beauty of the Word of God- despite the numerous different writers of scripture, and the time span over which they wrote- the message is one of perfect continuity and agreement. The book of Revelation (and especially the letters to the churches in chapters two and three) demands that the reader have at least a basic understanding of the Old Testament. You will encounter names like Baalam, Balac, and Jezebel. You will see references to the children of Israel, the tree of life, the hidden manna, and the "key of David." Many people view the seven churches as representative of seven church "ages" before the rapture. Using this "formula" then Ephesus would be the first century/apostolic church, moving on through the dark/middle ages, then Laodicea being the last church would represent the end-times church. While this view definitely is intriguing, and there are definitly some similarities which make this interpretation attractive, this will not be the approach of this particular overview of the seven churches. I think those types of theories are o.k. as far as speculative material, but for me the literal approach is best. In other words, I believe these 7 churches were seven actual churches in Asia minor. The messages to the seven churches are timeless. The things that Ephesus faced....we face- the things that Smyrna faced-we faced- and so on and so on. 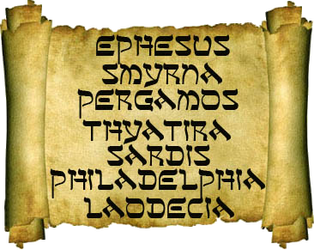 In almost every church today, you will find "Ephesian" Christians, "Sardis" Christians, and "Laodicean" Christians. The problems, temptations, promises, and blessings are all still issues that we wrestle with today. The Spirit is still making the plea today for those who "have an ear" to hear what He is saying to the churches. Most of the messages to the churches follow a similar format (with Smyrna and Philadelphia being the exception to this rule). Christ addresses each of the churches in a particular way which reveals something about Himself. He also finds areas of strength, virtue, and commendation to reinforce and encourage the churches. He will then tell about the negative aspects of the church and the various sins each are guilty of (whether it be idolatry, false teaching, apathy, immorality, etc.). He then pleads with each church to repent of their sinful deeds. Then the churches are faced with the choice of a blessing or a curse. For the "overcomers" there are promises and blessings beyond the wildest imagination of the reader. Consequently, for the unrepentant, there is the promise of sure judgement- both temporal and eternal. One theme that you begin to see is the great love that Christ has for His churches and for His servants. Even despite their failures and shortcomings, you see the outstretched arms of a loving Saviour. Rather than leaving each church to their own devices, Jesus intervenes to warn them of impending danger. The sole purpose of the Bible is to point to God's purpose, which is to reconcile sinful man to God through Jesus Christ, His Son. God's plan is to restore all things as it was in the beginning, before the fall of Adam and Eve. God dwelling with man and man, while subject to God. ruling over His New Earth (Rev 21:7).